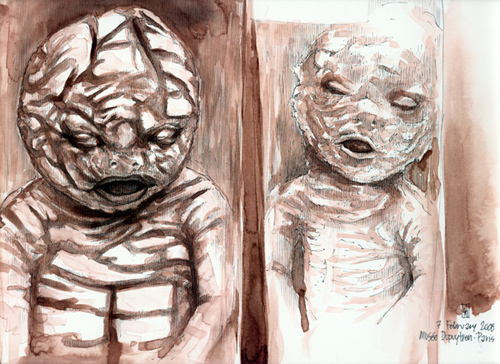 This drawings represent two examples of congenital harlequin ichthyosis in the collection of Musée Dupuytren at the Université Pierre & Marie Curie in Paris. This rare skin disease exhibits a thickening of the keratin layer of skin (hyperkeratosis), which presents an appearance similar to the scales of a crocodile. As the skin tends to crack where it should fold, bacterial infection is common — and often fatal. Additionally, the affliction causes severe facial and cranial deformities, most notable in poorly formed or absent noses, ears and eyelids. The hard, scaly skin also restricts breathing and normal body heat regulation. The designation “harlequin” comes from the diamond-shaped scales which resemble the costume worn by the comic opera character of the same name.